As carriage drivers, one of our most valuable communication aids is the whip. In fact, it’s so important that we are required to have the whip in hand anytime we are driving in a competition. Like any tool, it can be misused. The American Driving Society lists “excessive use of the whip” under the section regarding conduct and cruelty in the rulebook. The definition of the term does not have very specific instances of what constitutes “excessive use” other than striking a horse’s head with a whip. Even then, it allows for an exception for emergency situations. The penalty for excessive use is, however, quite clear. In a competition, the driver can be disqualified, barred from competition, and further penalized with fines or other disciplinary actions. With such significant consequences, it’s understandable that many drivers worry about being cited for such a violation. Obviously, the rule exists for a reason. The health, safety, and welfare of the horse are the foremost concern when it comes to rules regarding conduct and cruelty. If someone chucks a nutty and beats a horse with a whip, disciplinary action should be swift and unyielding. That’s not what worries most drivers though. Their concern lies with being cited for “excessive use” during the regular course of driving. So when does a well-tempered driver fall under the definition of excessive use? We could easily exchange the words “excessive” and “ineffective” when talking about this subject. 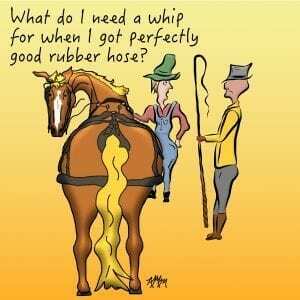 When the horse does not respond to the whip, often times the driver reapplies the aid. If the horse doesn’t respond again, the driver uses the whip again. This can happen in a ring, or more often than not in the heat of competition where speed is a factor. Years of programming has told us on a deep level that “whip = fast”. So the faster someone wants to go, the more they use the whip. Viewed from more than 50 yards away, an observer sees only that the whip is striking the horse time and again every 3 – 5 seconds. This is probably the most common circumstance under which drivers are cited for excessive use. The driver is approached at the first reasonable opportunity an official can get to them. This can be on course in serious situations, or just as the driver is coming off course. Usually, once pointed out to the driver, their reaction is bewildered embarrassment. Often times the driver wasn’t even aware that they are using the whip as often as they were. It’s almost to the level of being an involuntary action on their part. At this point, a judge will usually examine the horse. If the horse appears to be in good condition, good spirits and doesn’t show any signs of abusive whipping such as welts, the driver is given a stern warning. If, on the other hand, the horse is exhausted, frantic, or worst of all, exhibits physical trauma from the whip, the driver may be disqualified, and may even be instructed to unhitch their horse then and there to be returned to the stable. The unintended consequences of the term “excessive use of the whip” are that in many cases people interpret the term as “any use of the whip”. The whip is a useful and necessary communication aid. Experienced judges know this and will not penalize you for using it correctly in the midst of a dressage test, ring class, or any other circumstance. The difference between correct and excessive use is usually intention and efficacy. When a driver is using the whip, it’s usually pretty clear if the horse is responding to it. Sometimes it takes a second touch, but if a horse shows a change in response to the whip, the use was probably well timed and warranted. If however, the whip is used repeatedly with no change, it is pointless. All too often, people fall into the trap of repeated use of the whip because they’ve never taken the time to teach the horse what they mean when they use the whip. To avoid this trap, work with your horse at home to teach him how to move off the whip. If your horse is responsive to the first or second touch with a whip, you won’t feel the need to follow those up with two or three more touches. Of course, you will also enjoy the benefit of the use of an aid that can be used to direct and balance your horse. When you do use your whip, make sure it is clear, on target, and in context. Your horse is far more likely to recognize the communication if it lands purposefully at the right place and time. If you are barely touching your horse when you use your whip, he will likely ignore it as an incidental touch the same way he ignores those accidental touches that we make with the whip while managing the reins. Similarly, if you use the whip on the horse when moving forward or away from the whip simply isn’t a realistic option, he’s going to discount the communication. Examples of that would be using the whip half-way up a steep hill, or after the horse has lost his balance and is falling into a turn. In either of those cases, I can imagine the horse rolling his eyes in his mind say “Right, and now you tell me…” The time to send the horse forward is before you hit the incline, not when he’s pulling his heart out on the hill he didn’t know you were going to turn him up. The time to use the whip in a turn is in the approach to the turn, rather than after he’s already lost his balance. Don’t let the fear of being cited for excessive use paralyze you from making use of this valuable communication with your horse. Take a little time to practice with the whip at home. Teach your horse what it means when you use it, so when you need it, it’s effective. Keep an eye on those repetitive habits, being sure that if you touch your horse that it was a purposeful effort to communicate. Finally, don’t be evil. If you’re losing your mind over your pony not moving, tip that whip up and out of the way. It’s not a problem that you are going to solve with the whip in the heat of competition. It’s interesting how you said that a driver could be disqualified or banned if they were to use a whip too much. I think that this is wise because it helps to avoid doing damage to the horse. It would be a good idea to ensure that you have the right kind of whip because then you’ll be able to get the reaction you need from your mount and whipping excessively could be avoided entirely. Right you are Kylie! In addition to using a whip that you can you can use effectively communicate, it helps to teach the horse what those communications mean. Teaching the horse what you want as a reaction to the whip means that you can use it as a communication aid. I’ve posted two lesson plans to help people teach their horse how to respond to communications from the whip.